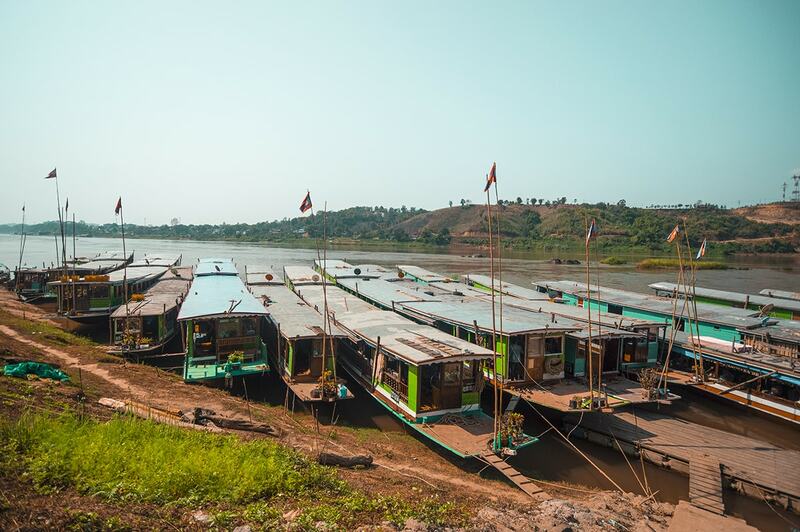 I had read numerous horror stories about taking the slow boat to Laos. 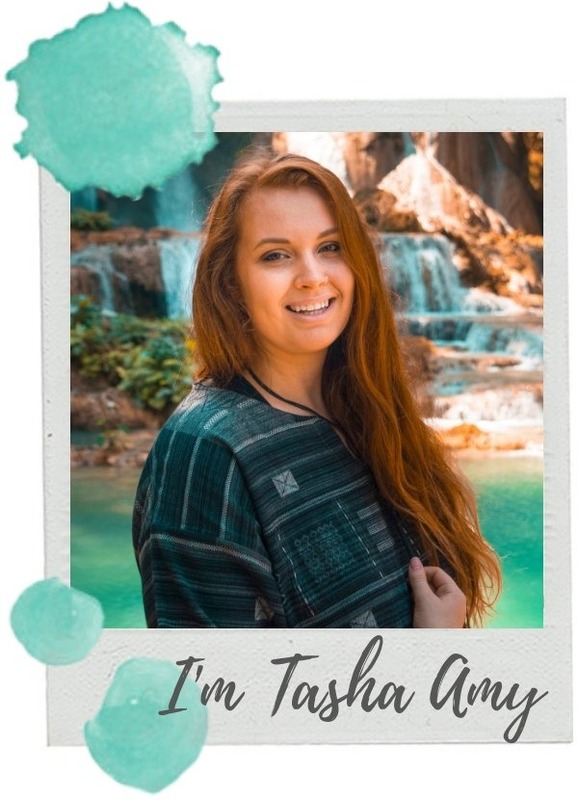 Though, obviously not phased enough by the infamous rumors I decided I would take the journey and form my own opinion on the two day adventure. 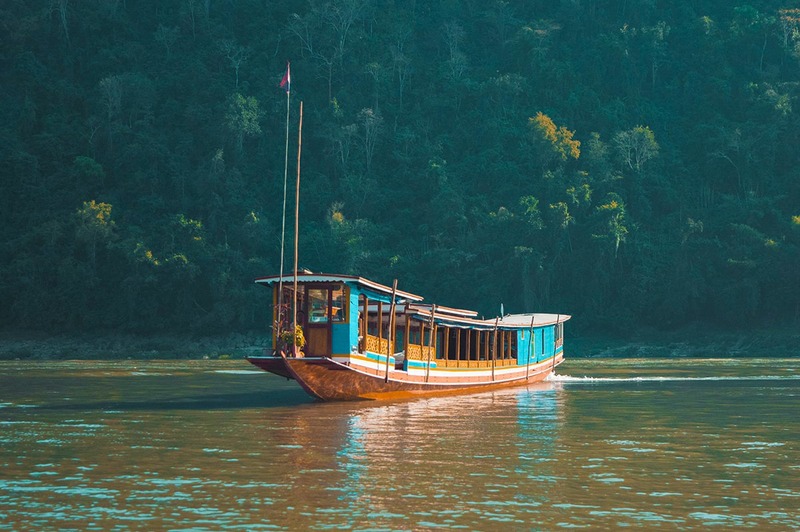 The slow boat is no doubt the most popular way for all types of people to travel between Northern Thailand and Luang Prabang, Laos. Though, it is certainly not for everyone which I found out while taking the slow boat. 5 Is It Worth Taking The Slow Boat To Laos? My alarm goes off, jolting me awake. Today would be the day that I had been planning for, taking the slow boat to Laos. Previously we caught a 6 hour minivan from Chiang Mai to the border town of Chiang Khong. We had spent a couple nights here chilling out and enjoying the crazy cheap prices of the north. Our private twin room cost $5.70 ($2.85 each!) at the Namkhong Guesthouse and Resort. It has a lush garden area and a big pool, what more do you need. Another plus is that it is just down the road from an awesome local restaurant called PadThai Baan Yim Restaurant. Drinks, two appetizers and two mains would cost less than $5.20 all up! Packing our bags and heading onto the street we stop at the mighty seven eleven and grab the staple breakfast of any backpacker in Thailand, a toastie. Once all sorted with that I flag down a tuk tuk and pay the $4.50 charge to take us to the border. Racing through the town the cool morning breeze is a refreshing change from what we are use to. The roads are busy with vendors selling foods at the morning markets. Dust looms in the air from the dry landscape. Soon enough the hustle and bustle disappear behind us and the landscape opens up to a large building in the distance. Being early morning the border is extremely quiet. We are quickly processed through the Thai side and officially exit the country. To get between the Laos and Thai immigration offices you will need to pay $0.75 for the bus. The ride lasts about 10 minutes and goes over the Thai-Lao Friendship Bridge. Though, we had to wait about twenty minutes in a line with about thirty other people for the first bus to depart. Of course the bus driver was late, a typical occurrence in this side of the world. When you jump off the bus on the Lao side it is definitely a mad rush to get your forms filled out to avoid delays. Just make sure you write it out correctly and have a pen with you! The visa fee was $30.00, though this amount changes depending on where you are from. In case you don’t have USD there is an ATM a few steps away so no need to worry about getting cash beforehand. All up the process probably took about thirty minutes to receive our Lao visas and the majority of this time was spent waiting in a line. In Laos a tuk tuk is basically a songthaew or a pick up truck. They no longer only fit a handful of people in and now instead fit at least six. There will be plenty of these tuk tuks at the border waiting to take people to the slow boat port. Though, being early in the morning we waited for about fifteen minutes for some more people to join us. Unfortunately, this never happened and we ended up paying $11.00 or $5.50 each for a private ride. At the pier we are quickly directed to the ticketing booth to purchase the slow boat tickets which would take us to Luang Prabang. They took our passport information and we are given allocated seat numbers. The ticket for both days cost $25.30. Heading down to the boat we dump our bags at the back and wait patiently at our seats. There are about ten other people on the boat, though on the list of seats back at the ticketing office was already quite full. I can only assume there are a lot of people staying in Huay Xai who booked the day before. Unfortunately, James and I are not seated together. Though, in Asia rules are nonexistent so we just switch around a couple pieces of paper with ‘seat numbers’ written on them and chill out. Many other people did this as well, it ended up being the solo travelers siting together and those coupled up in another group, so everyone was happy. At this point it is still mid morning and to my surprise the boat doesn’t depart until 11am. We stock up on snack from a couple local stores, which line the road heading away from the pier. It is a six hours until we would next be off the boat so food is certainly necessary. Luckily I manage to spot a lady selling baguettes as well so I grab a couple of those. All up the lunch foods add up to $3.00. As the boat begins to fill up the weight pushes us deeper in the water and the crew start preparing to depart. The majority of people on the slow boat are tourist, though all up about 20% of people are locals who sit up front. The seats on the boats are surprisingly comfortable. I assume they are chairs ripped out of old vans. Though, they are not bolted to the ground so its a fight for leg room. We head off not long after we are meant to and begin our journey down the river. The countryside goes by and it quickly becomes the same view for the next six hours. The speed we are traveling provides an extremely enjoyable breeze, a great relief from the hot temperature. Rubbish flows downriver with us and its saddening to see the large masses formed on the riverside, nearly creating little islands. A six hour boat trip with no books to read and a limited amount of battery left from the previous hours I spent playing candy crush has left me with not much left to do. Boredom eating has set in and I will be the first to say that baguette did not last long. I decide to grab a cup of noodles from the vendor at the back of the boat. The overpriced $1.20 cup keeps me entertained for the next thirty minutes as I stare at our location on google maps slowly get closer to Pakbeng. I am going to mention the toilets on these boats as someones got to warn you. In all honesty the toilet itself was not too bad, but good lord did it flood. 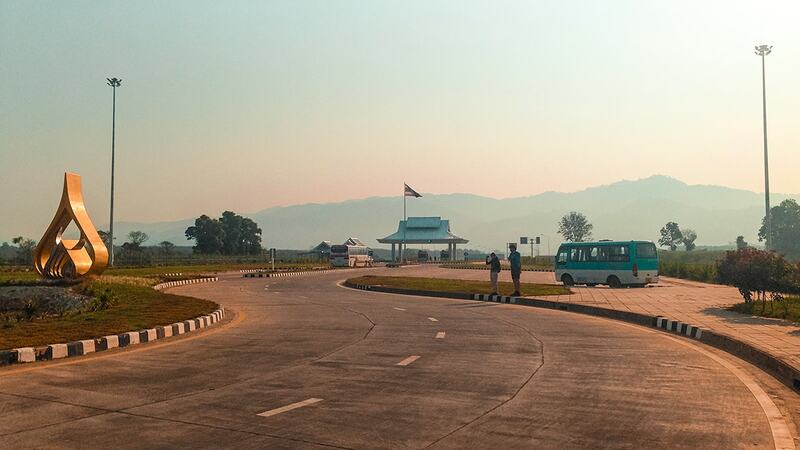 Try to go relatively early on in the trip and then hold on until you arrive in Pakbeng. I am going to assume its water from the bucket which is used to flush the toilet, and fingers crossed no other kind of liquid. Though, I would not be surprised with all the drunk people, which is another good way to pass time. First thing first, do not book your accommodation in Pakbeng in advance unless you are wanting to stay somewhere super-duper fancy! Even in saying this no place in Pakbeng is truly fancy and certainly not worth the prices you see online! Secondly, do not listen to the man who will come onto the slow boat at the beginning of the journey and start selling accommodation. These beds are overpriced. Just wait until you arrive. Arriving in Pakbeng was a great relief, I could not wait to get out and start stretching my legs. We arrived an hour earlier than expected and this is in the dry season when the water levels are low. There is a mad panic with everyone grabbing their bags quickly. Its difficult trying to walk back and forth down the small alley in the middle of the boat with suitcases and backpacks. Ours are at the bottom since we were one of the first to arrive that morning, so we chill out and wait for the crowds to disperse a bit. Departing the boat there are numerous people standing around the rivers edge holding signs up with available rooms. Pick up trucks wait on the road to take people to their guesthouse. Pakbeng is quite a hilly area so the cars are much appreciated. We booked at the Phomephithak Guesthouse for $14.00 total. We were one of those stupid people who booked via the guys who came onto the boat at the start. Arriving at our guesthouse in all honesty it was not that organised. With people being directed to rooms which were already full and not having enough available, even though it was all pre-booked. We ended up in a room with a double bed, private bathroom and air con on the second story. It was relatively comfortable and I enjoyed the air con. That night we headed down the road to find somewhere for dinner. My advice is to find somewhere with a good view over the river. We ended up at a restaurant just up from the Happy Bar. The food was reasonably good and by the time our meals came out the place was full. I just ate a sandwich for $3.90.We also order our lunch for the next morning as well before heading off to bed at our Guesthouse. The following day we get up to a slight chill in the air and the sound of roosters. Back down at the same restaurant as the previous night we grab breakfast and watch the elephants across the river have their morning bath. The breakfast and packed lunch cost $5.40. Afterwards we grab our bags and head down to the slow boat pier. Jumping on the slow boat the crowds are already lining up on the rivers edge and we get worried its too late to get a decent seat. Its well known that the seats at the back are the worse as the motors on the boat are literally deafening. You would certainly still be hearing them when you fall asleep at night. Luckily as we line up they start filling up a second boat and we mange to snag a couple seats near the front. Continuing down the river for our last day on the journey we are all a little over it. I quickly fall asleep to the rocking motion and hearing the river rush by. I wake up to a wee bit of a commotion as the boat makes its regular stops along the river to drop off locals to their village. A tourists backpack and been taken off by someone thinking it is one of the village persons. 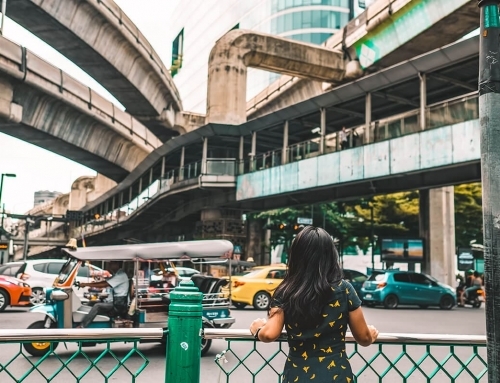 The Laotian people don’t understand why this foreigner is freaking out and us tourist don’t know how to say to the Laotian people to stop driving away. Luckily a young local women is able to translate and they pull back into the rivers edge to collect the bag. The young backpackers life is restored and we all cheer in relief. Continuing down the river, still equally as bored as the previous day it is time for noodles round two. I am vegetarian and I have no idea what type of noodles are which, especially as the lady behind the counter makes them. I basically check which one appears less meaty, pick up any lumps of meat looking substance and give the other one to James. The overpriced noodles of $1.20 have kept me sane a little longer. The last couple hours away from Luang Prabang the scenery on the river finally begins to change. It becomes a lot more mountainous with limestone karst jutting up out of the ground. Personally, I think this is the most picturesque part of the journey and certainly gets you excited for the adventures to come in this amazing new country. 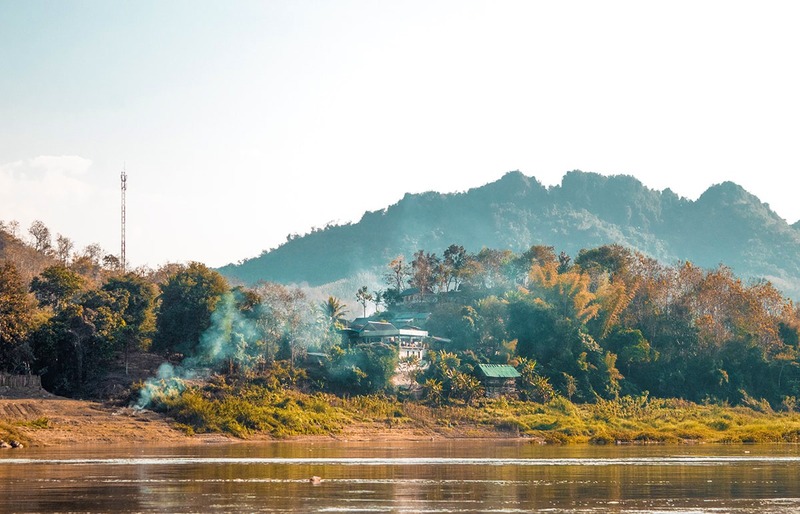 One of the main things you will read online about the slow boat journey is being dropped off in the middle of nowhere and have to pay ridiculous prices to get into the center of Luang Prabang. This is what I had prepared myself for and luckily our arrival was nothing like this. Docking up at the port everyone formed a human chain to help get the bags off in a timely fashion. The late afternoon heat was intense and the sun was blaring down at us. Once we received our bags it was a short but steep climb up the river bank. Surprisingly, at the top was a formal tuk tuk stand. Here we gave our details, paid $2.40 per person, and then jumped on the next tuk tuk leaving. In all honesty it was extremely organised and no one was demanding ridiculous prices as it was all fixed. As we are leaving a few people decide to walk along the dirt road to flag down a tuk tuk. It is known that you will get a cheaper rate. Though, I could not imagine lugging my bag down there, especially in this heat. Plus I felt $2.40 was a reasonable rate to pay. Our guesthouse while in Luang Prabang was the Phanhthasone Guesthouse. It was about 20 meters from where we were dropped off in the tuk tuk and cost $18 per night . We stayed in a deluxe double room with air conditioning, a private bathroom and even a television. Guess, what, we even manged to find it without knowing our location or using our phone! That’s the one and only time thats ever happened. 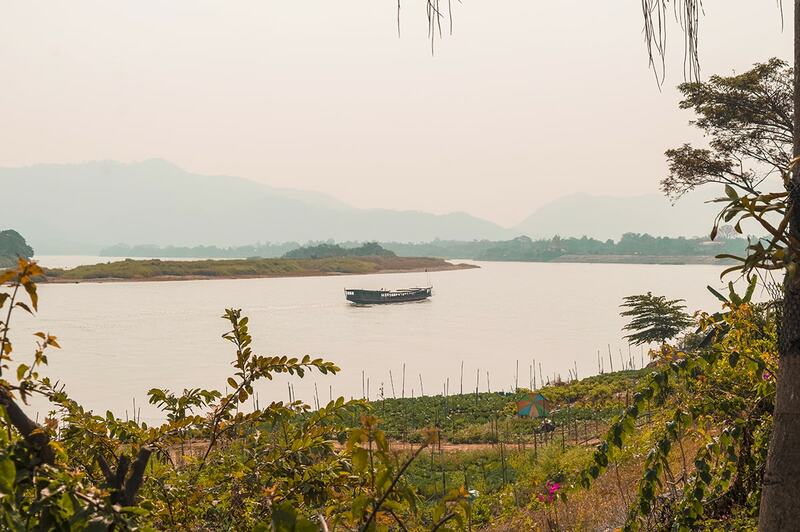 Is It Worth Taking The Slow Boat To Laos? 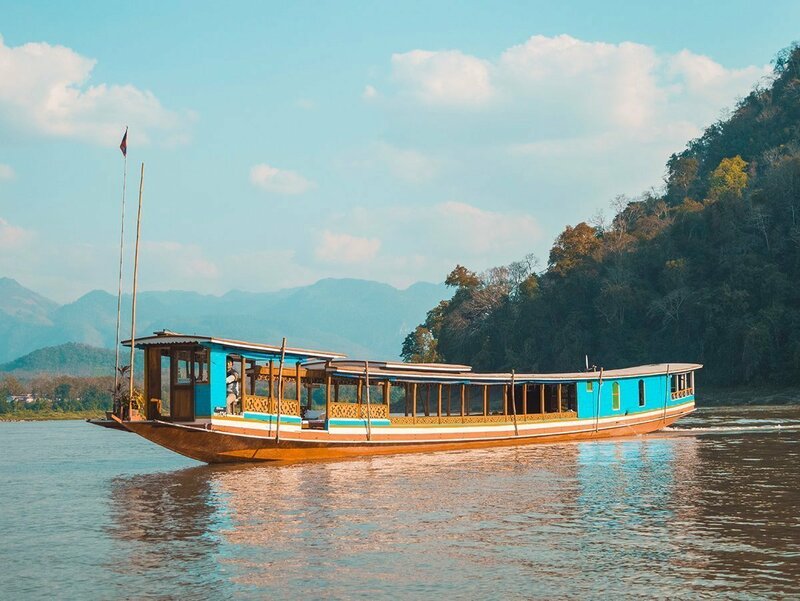 In my opinion I reckon taking the slow boat to Laos is a good way to travel there from Thailand. I personally had no bad experiences on my journey, though there are plenty on the internet. Just do your research and do not set your expectations too high. If you are not sure whether taking the slow boat to Laos is the best option for you check out other options. Being a budget traveler I had no issues whatsoever taking this mode of transport. I would truly recommend it to all like minded backpackers. What month did you do this journey in? I’m looking to do it in September and wasn’t sure whether the fact that it is rainy season would affect my ability to do son? Hey Chloe! I did this journey in February. Though as far as I am aware the boats run regularly throughout the year. I have heard that the boat trip is actually faster (and more bearable) during the wet season and after the wet season as the water currents are stronger, so in my opinion September would be a perfect time to do it. Maybe just spend a night before in Huay Xai to ensure you get onto a boat as its likely they do less trips per day in the wet season. This post is so so helpful! I’ve saved it for when we do the same trip in April. Thank you! I will be taking the slow boat in a few days and feeling a bit nervous! Thank you so much for sharing your experience. I loved how well you described exactly how it went which is easing my nervousness. I am looking forward to the experience! Beautiful shots. I would love to take this tour. OMG you are brave, especially for a young lady like you. But i am sure everything seen or experienced for the first time are exciting. 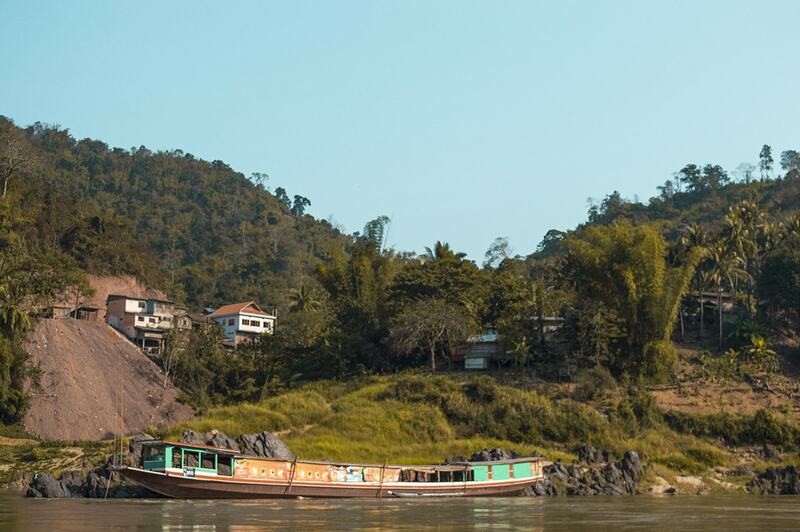 I wish to visit Luang Prabang too, but certainly not via this slow boat. I saw boats like those in Myanmar but not sure where they are going. My most exciting trip done first time was the 5 hr bus ride from Queensland to Milford Sound at the South Island, NZ. I hope to do it again. Very informative! I’d do the same thing, I love boats! It’s cheap and it seems cool! Ooh, I’m planning to do that trip in the next few weeks and am so looking forward to it. Great post! I always love reading your blog posts and this one is no different! You have AMAZING photos like usual! And I will be planning my entire trip to Asia based on your trip. So I will be following in your foot steps. Looking forward to it! Hahaha. Perfect info, thanks! 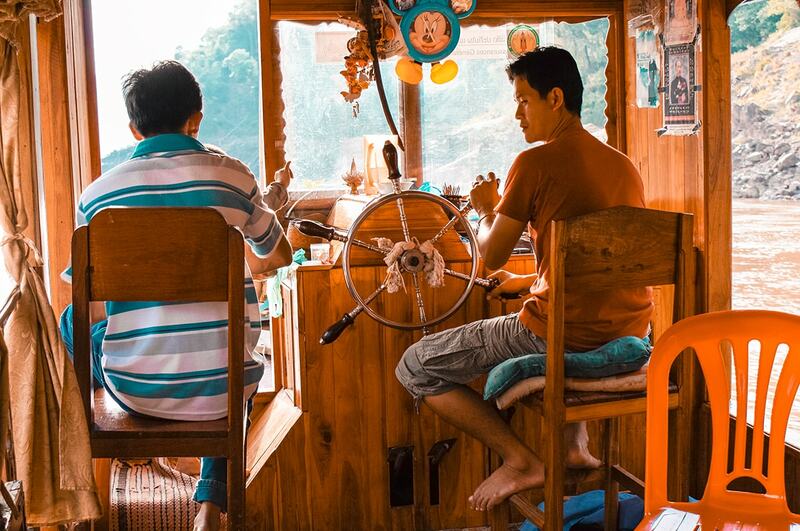 Wow I never thought about taking the slow boat, looks like a cool and cheap way to get around. Cant wait to visit this area! Sounds like a worthy adventure and way to immerse in the country – as long as you have the time. I’d pack a few books (page turners) and settle in. Wow! This looks super adventurous! Going to be in Chiang Mai in December. Now you’ve got me interested! I have never had a boat ride before, and this looks lovely. I love any chance of slow travel to savor my surroundings! Amazing photos. Thanks for the personal insight. I’d love to go to Southeast Asia one day. Laos looks lovely! This is such great advice! I will definitely remember it for when I will go to Laos. Thanks for sharing! Great photos here! I’ve always wanted to check out Laos and this sounds like it could be a good way to get there if nothing bad happens! Haha glad you had a good experience! What an amazing adventure. i love that you took a risk and tried something very different and it paid off! The boat trip sounds so worth it and like it would create amazing memories. I also really appreciate all the links you embedded into your post. Happy exploring! Tasha your photos are beautiful! It looks like such an adventure, I’d love to explore this region some more! Wow! I did not know of this! A very detailed and lovely post! Shall definitely consider this option when Im planning for Thailand and Laos 🙂 Thank you ! Was interested to read this because I considered doing it but really didn’t have the time so I flew from Chiang Mai to LP instead. I would like to do this sometime (even though it sounds like a mission with crazy Asia BS…as I fondly call it after being there 3 months). 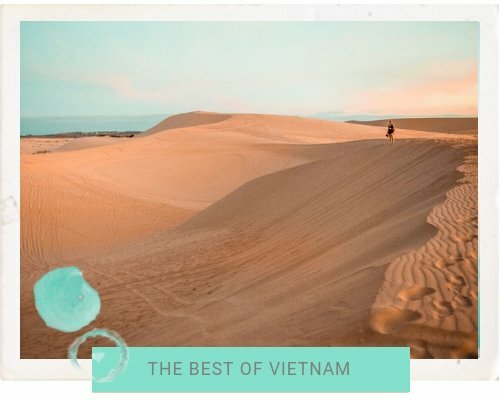 It looks like a memorable experience and so very SE asian. 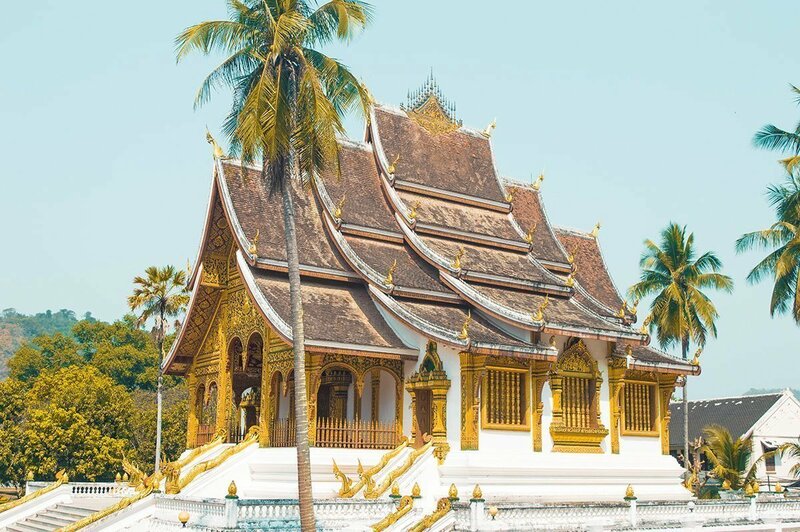 I LOVED Luang Prabang and hope you did too! This sounds so relaxing! I will have to check this out when we venture into that area! Thanks for sharing! This was a great read although I’m not sure I’m sold on the idea of taking the slow boat! 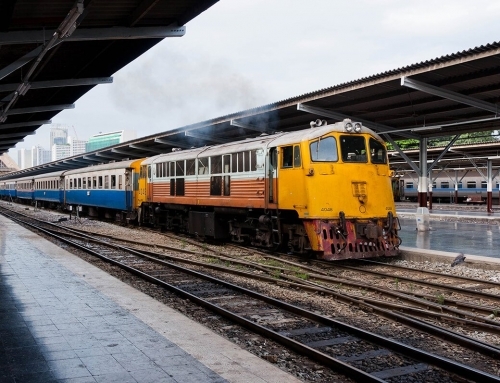 Great link to the alternative methods of getting to Laos. It was interesting to see all the prices you paid for accommodation and food etc. I’ve become a bit too used to European prices so these seem like a bargain! Love the way you tell the story! Its good to hear a positive experience although I don’t think the slow boat is for me, I get cabin fever too quickly! Thanks for sharing! I had almost the exact same feelings when we went to the Catacombs in Paris. It was interesting, but an hour and a half walking through the same interesting kind of got a bit boring! I am glad I did it to get my own experience from it and really see it, but there were a few lulls! 😉 It sounds like an experience that’s worth it, but being prepared for what it’s really like helps. So this post was great. Your photos are great btw. I wanted to do this when I was in South East Asia but ended up not being able to. I’d love to go back and experience it! Very interesting. Doesn’t sound too bad to me except for the toilets – I am not sure if I would be able to handle that. I also can’t believe how cheap everything is in that area! What a story ! I would totally do it too !! The light in your photos is amazing! Thanks for sharing the little tips in your post, especially about the toilet on the boat – something I’ll be extremely concerned about, lol. This looks so much more enjoyable than taking the bus from Luang Prabang to Chiang Mai (20+ hours, what I did!!) I agree the scenery on the river close to LP is incredible – with a good book to read and plenty of food (and not too much to drink!) this journey looks incredible! And definitely better than the bus ;-). 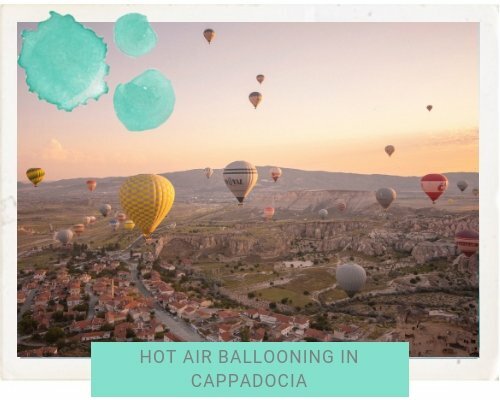 I love your photos – so whimsical, and really shows the slow life of this kind of travel! This looks like something to experience even though I do not particularly love sitting still for long periods of time. 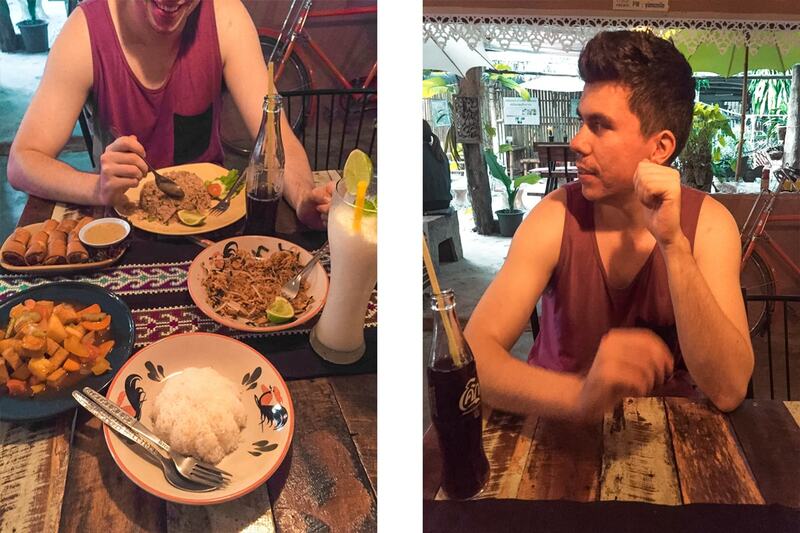 But definitely a good option when travelling from Thailand to Laos, thank you for sharing! seems like it would be an experience itself just to have done this mode of transport! And so cheap! yeah im sure the bathrooms were a situation. i love that 7-11 is all over asia – always a good choice! I had no idea this existed! Its the perfect way to travel! 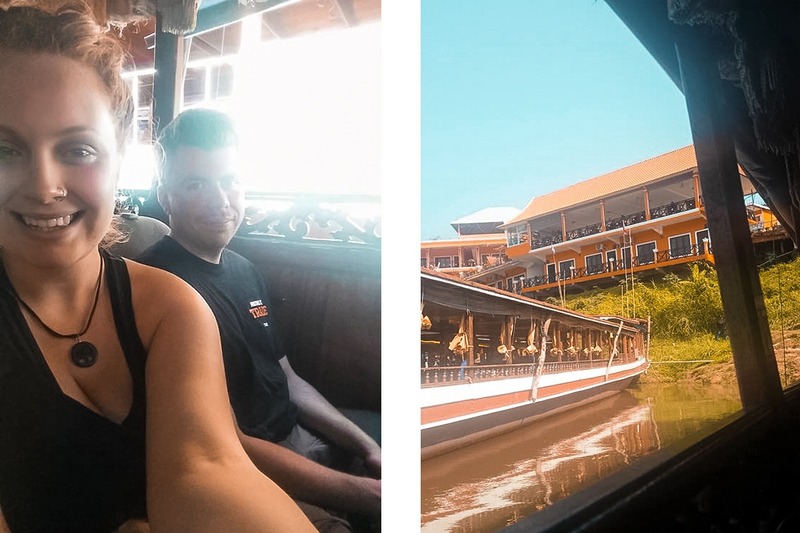 I actually had no idea there was a boat option to thailand! Thanks for this! I didn’t even know this was a way you could travel from Thailand to Laos. Very cool! Although, I do think I’d probably be pretty stir-crazy by the second day. Sitting isn’t really my thing. 🙂 Still, great way to travel, see pretty scenery, and do it all on a budget! Yeah there are not too many overland options to travel between Laos and Thailand, though this is definitely the best way! It honestly isnt too bad, its just like taking a bus two days in a row! Lovely post! I’ve never been on a slow boat but now I think I’ll definitely have to try it at some point. Beautiful pictures! Such an incredible experience and SO affordable. I love that you managed to find your accommodation without the use of phones, I can’t wait to visit someday! 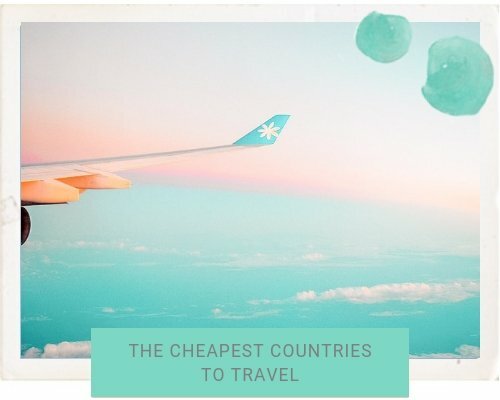 Laos is an extremely affordable country! You should do it! Its an amazing experience, a lot more exciting than the regular buses! I tend to get sea sick and therefore I am not a big fan of boat rides. I did some anyway for several hours and can totally relate how boring it can get. And I can also imagine how these toilets must have looked like. And two boat trips one consecutive days must be even worse haha But yeah, I am a budget traveler as well, so I guess I would have done the same nevertheless. Thanks for sharing!